The Best Buy Cares Survey, found at www.BestBuyCares.com, is an online survey designed by Best Buy that allows customers a chance to leave feedback on products and services offered by them. The company then uses this information to offer you a better shopping experience by meeting your needs. This is an online survey, so you can take it at your leisure. By participating in this survey, you will give beneficial feedback to the company and they will use it to give better customer service and update their products. As a reward for helping, you can enter to win a $5,000 Best Buy gift card. Best Buy is the place to go for home appliances, televisions, computers and accessories, and other electronics items. From its modest beginnings as a single music store in Minnesota in 1966, the brand has grown to have over 1,000 stores all over the US and around the world. The company employs around 125,000 people and has an annual revenue of about $42 billion. Best Buy makes a point of keeping up with the ever changing world of technology, making sure its stores carry a wide selection of the latest electronic gadgets, usually at competitive prices, and it is known for the technological expertise of its staff. 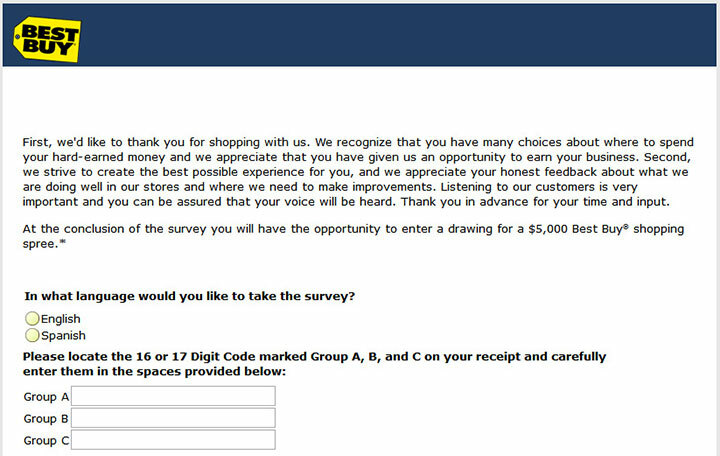 Have your recent Best Buy receipt that contains an invitation for the survey. Enter the codes from the receipt. These will be marked Group A, B, and C. There is a diagram below the text boxes to help you find the information on your receipt. You will be asked a series of questions. Please answer these as honestly and as thoroughly as possible. To move to the next page, you must answer all questions on the current page. At the end of the survey, you will be asked for personal information needed to enter the sweepstakes. This information can include name, address, and telephone number. Read the instructions and answer fittingly.